A woodcutter welcomes folks to the History and Visitor Information Centre, of this old timber town. Dwellingup has become a year-round destination for many visitors. The Dwellingup History and Visitor Information Centre is located in a building on Marrinup Street, and is constructed from local timber. It houses a unique collection of historical items related to the Dwellingup area including the rise and fall of the mill towns, the 1961 bushfires and the POW camp. The world-class Forest Discovery Centre offers a unique look at the areas forest heritage including an 11 metre forest canopy viewing platform and series of walkways. It also houses the School of Wood. Dwellingup is situated in a timber and fruit-growing district east of Pinjarra. It has a population of around 400, and the name is derived from the Nyoongar word for place of nearby water relating to the proximity of the Murray River. In the early twentieth century the major industries of this district were farming, timber milling and railway sleeper cutting. The Track is aligned in many places along the old railway formations. Dwellingup was a busy town with a hotel so popular that it was common for a thirsty latecomer to be unable to get into the bar. The hotel was one of the few buildings that survived when Dwellingup was almost completely destroyed by a severe bushfire in 1961. The little steam train puffs through the bush in the winter months. The Hotham Valley Tourist Railway's Forest Train travels between Dwellingup and Etmilyn (8km) on Saturdays, Sundays, public holidays and on selected days during the school holidays. The train departs from Dwellingup Station at 10.30am and 2pm. 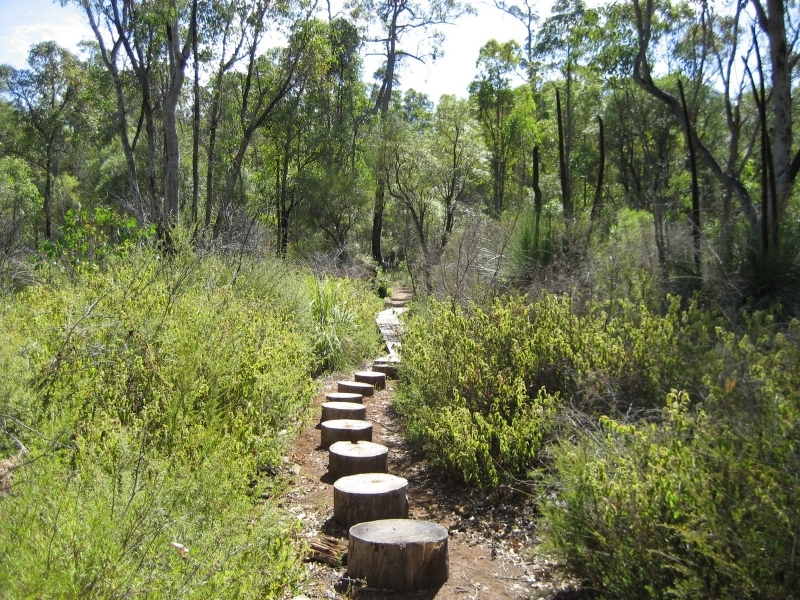 Get a one-way ticket and walk back on the Bibbulmun Track. Kalamunda is 96km north of Dwellingup - a drive of one hour and 20 minutes. The walk between the two towns is 180km, which takes approximately thirteen days, twelve nights. 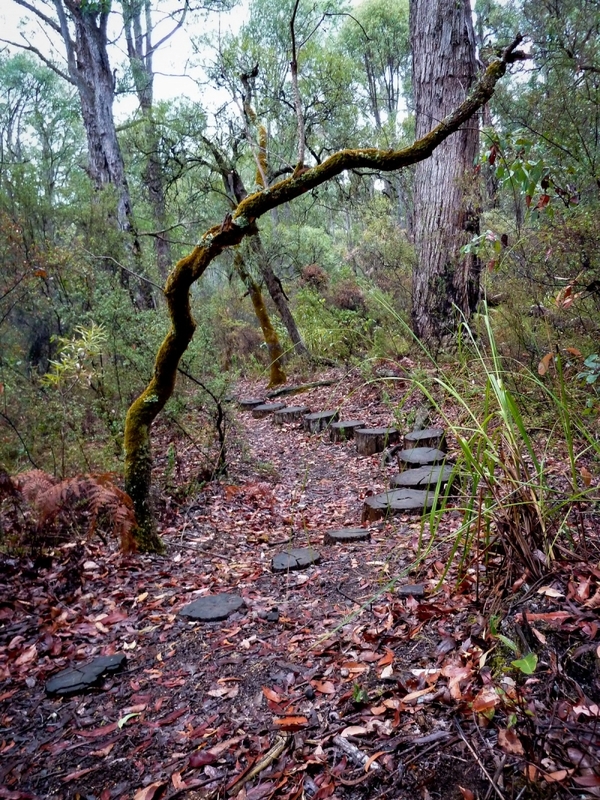 North Bannister is a four day (67km) walk north of Dwellingup. Whilst it is not a town, there is a roadhouse (known as Threeways) which can hold food parcels by prior arrangement. This is the only place to resupply between the towns and has limited choices. Collie is 89km south of Dwellingup - a drive of one hour and 20 minutes. Walking between Collie and Dwellingup (122.1km) takes approximately seven days, six nights. Accommodation of all types can be found in Dwellingup from vehicle-based camping, to self-contained chalets and B&Bs. The town has a few cafés and the local community hotel, which is open seven days a week. It also has a post office, camping store and a general store where walkers can restock with food and supplies. There is no pharmacy in Dwellingup but a nursing post is open on some weekdays. There are no banks but there are cash machines at the general store and the hotel.